Improvements in finite conjugate microscopy objective systems allow optical testing systems to decrease form factor while maintaining and often increasing performance. 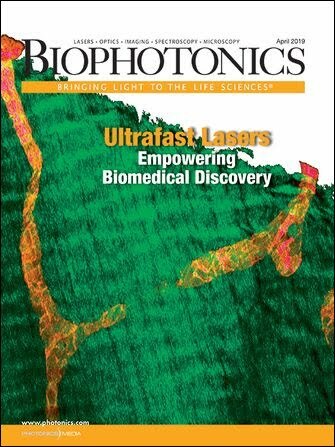 NIRANTHA BALAGOPAL, EDMUND OPTICS INC.
Miniature fluorescence microscopes and other system components, such as liquid lenses, are among emerging microscopy advancements that are bettering optical inspection in areas including the life sciences and machine vision. Now, such technology is taking researchers, microscopists, and others deeper into cellular and biological samples. Microscopy objectives are essential components of applications such as medical diagnostics. Courtesy of Edmund Optics. The key optical component to any microscopy system is the objective. Broadly speaking, objectives can be categorized into two designations: finite conjugate and infinite conjugate. Traditionally, finite conjugate objectives have been used for laboratory systems and generally paired with an eyepiece. However, they could also be used with a sensor. Such objectives can focus directly and do not require the usage of additional focusing optics — although the image and object distances are very specific, and performance will deteriorate if used with other conjugates. Infinite conjugate objectives, on the other hand, allow additional components to be inserted into the beam path. These components could be beamsplitters or wavelength-specific filters. Though such components can offer significant flexibility, an additional tube lens is required in the beam path to focus onto a sensor. This quickly adds physical length to the system, as extra space is needed for the optimal objective-to-tube lens distance (to prevent vignetting) and the back focal length of the tube lens (Figure 1). System length is further increased with tube lenses that have longer focal lengths, which are used to produce higher image quality due to the smaller off-axis ray angles. Figure 1. Standard video microscopes use infinity-corrected objectives, while tube lenses add extra length to the system. Courtesy of Edmund Optics. In certain controlled laboratory settings, this lengthier system may not be a cause for concern. However, in other settings — for example, the manufacturing of deployable industry products, such as hand-held lab instruments or portable medical devices — form factor of the imaging system becomes a concern. It would seem the obvious conclusion could be to use finite conjugate objective systems whenever physical space is, in fact, a concern. In the past, “major microscope manufacturers had largely all migrated to the utilization of infinity-corrected optical systems”1 for a significant period of time, meaning high-resolution, micro-imaging systems were employing infinite conjugate objectives. The future of microscopy … will depend on miniaturization, system flexibility, device portability, and increased resolution. More recently, there have been improvements in finite conjugate objective systems. Newer, compact objectives are useful to scientists in the field or lab. Biotesting of samples — whether environmental, such as in local water, or medical — can then be performed in remote areas or in countries without quick access to lab testing. Further, on-site inspection can be done in the pharmaceutical world — whether looking at well plates or vials in a bioanalysis lab or pharmaceutical manufacturing facility — quickly and more easily using a hand-held, compact device. This is especially helpful so biological specimens can avoid being transported to a separate inspection facility, which could possibly expose them to contaminants. Many machine vision inspection systems, such as those used to inspect medical devices, semiconductors, etc., do not require the auxiliary components — dichroic, emission, and excitation filters — that a biological microscope might. In these cases, an increasingly relevant solution is to use very compact objectives that juggle magnification with short conjugates and small form factors (Figure 2). These are typically designed with standard C-mount machine vision camera flange focal distance in mind, as well as simplified mechanics for further reduction in size. And with fewer optical parts to align or thread together, such systems now have a smaller number of points where misalignment could occur. Figure 2. Advancements in new finite conjugate objectives have a much smaller form factor than traditional objectives. Courtesy of Edmund Optics. Of course, these compact objectives, similar to their traditional finite conjugate predecessors, also have well-defined working distances for set image planes. However, a certain amount of flexibility is afforded with the usage of extension tubes between the camera and objective to manipulate both magnification and working distance (while keeping the image focused at the sensor) to best custom suit the desired application’s demands. These modular systems are especially deployable, for instance, on factory floors where consistency in imaging is vital. Moving a step forward, liquid lenses can also be integrated into such systems, to adjust focus and even create an autofocus mechanism without the length variation of traditional optical focus modules. These liquid lenses are electrically tunable optical elements made of an optical liquid material. This fluid uses the applied current or voltage to change shape very rapidly — specifically, its radius of curvature and therefore its focal length — to alter the system’s overall focal length and working distance. This ability to precisely control focus is extremely valuable in automated inspection systems, where working distances from the object to the imaging system are strictly fixed. It should be noted that using a liquid lens by itself to image without any other imaging optics is not recommended, as this technology is best used in integration with a multilens assembly. Infinite conjugate microscope objectives work well in controlled laboratory settings, but compact finite conjugate objectives offer numerous advantages for portable devices where size and weight are of critical importance. Courtesy of Edmund Optics. This feature of liquid lenses is particularly helpful in microscopy applications that utilize focus stacking (z-stacking). For instance, if imaging various layers within a tissue, a traditional microscopy setup would require an adjustment of the imaging distance to physically image each layer of the sample. Liquid lenses allow the user to focus to a precise layer quickly, without having to make any mechanical changes. Further applications of liquid lenses in the biomedical world include ophthalmology, where the imaging and diagnosis process of the human eye can be achieved promptly and with fewer glass lenses than traditional setups. Certainly, there also are cases where small form factor and the use of auxiliary optical components are both necessary. The creators of the Miniscope project2 developed at the University of California, Los Angeles — founded upon a design published by Mark Schnitzer’s Lab at Stanford University — required a solution to imaging neural activity on freely behaving mice (Figure 3). Figure 3. The complete UCLA Miniscope featuring electronics and optics is extremely compact and modifiable for different labs’ needs. Courtesy of Edmund Optics. UCLA’s Khakh, Silva, and Golshani labs designed a fluorescence microscope that eschews the idea of a traditional, bulky lab microscope. With an optical path containing a gradient-index (GRIN) lens, optical filters, and an achromatic lens, the system weighs just 3 grams, with diameters of the optical lenses measuring 5 mm or less. This system design is important to gather the most informative data, without the studied mice being confined to a stationary and controlled device. Other miniature microscopes include even more nontraditional elements, such as the one worked on by researchers at the University of Colorado Anschutz Medical Campus, which uses a high-speed, variable focus electrowetting lens (EL) for axial scanning in a confocal fluorescence imaging system that, in its entirety, weighs less than 2 grams. The EL lens allows for variable focus without any mechanical actuation, keeping the system compact3. Further developments on miniature microscopes elsewhere are pushing the lenses even smaller to obtain masses of less than 1 gram4. The lenses in the light path of such systems are not the only optical components being miniaturized. With new miniature fluorescence microscopes, the excitation, emission, and dichroic filters need to maintain high optical quality while reducing their bulk as well. Advancements in ultrathin filters made of flexible polymers have produced filters with thicknesses of 200 to 500 µm (about one-tenth or less of the thickness of traditional filters), while maintaining optical quality competitive with traditional, stacked, coated filters (Figure 4). With their polymeric and dyed sublayers, the filters are comparably as durable as hard oxide coatings and are insensitive to scratches. For weight-sensitive applications, the ultrathin polymer remains advantageous over even hard-coated glass filters. Figure 4. Ultrathin polymer filters are extremely lightweight and flexible, making them ideal for weight-sensitive applications. Courtesy of Edmund Optics. Current ultrathin filters on the market do have a slightly higher wavefront error than coated glass filters, in part because of the thinness and flexibility of the polymer. A more rigid substrate will decrease this error but will have an increased thickness. The polymers also have a smaller operating temperature range than traditional and hard-coated optical filters. Though the advantage of a lightweight, high-resolution microscope and imaging device is clear when a small rodent must withstand the weight, these advancements in increased optical quality and decreased form factor are not limited to applications within the research and development world. Developments of new point-of-care devices come from this increase in demand for small, benchtop-type systems for simple tests, such as the newly FDA-approved VivaScope5, which clinicians can use to study cellular structure of the patient’s skin. In the inspection and testing world, these compact systems have use, too. On factory lines, inspection of medical devices or semiconductors requires very high-resolution imaging; compact inspection systems are advantageous for space-constrained areas. And with hand-held optical testing devices, researchers can conduct in-field testing of samples in any number of applications — consider on-site water quality inspection or real-time infection testing in a remote area — without having to send these samples back to a laboratory. With continued advancements in medicine as well, it seems possible for microscopy-driven optical biopsies to come from hand-held devices with near-instant results. There are disadvantages to the standard microscopy techniques previously discussed (where optical test engineers must become ever more creative), including parallax or perspective error. For example, in a chemical or pharmaceutical application, a researcher may have many samples in a well plate to inspect and analyze the size of the various parts. With conventional lenses, including microscope objectives, perspective error can be an issue even within the small depth of field. For applications where eliminating this error is important, telecentric lenses can become a viable optical alternative for inspection. Using a telecentric imaging lens will also eliminate the need for a long optical train, as with the infinite conjugate microscopy system. This can be especially advantageous with high-resolution, high-magnification, telecentric imaging lenses being widely available off the shelf. When designing these optical systems, the choice of imaging device/sensor must be very deliberate. New compact microscope objectives could achieve high optical resolution, but the user should be careful about the limitations of a chosen camera sensor; the user should also certainly understand the relationship between the desired resolution and the sensor’s pixel size and limiting resolution (Figure 5). Figure 5. The resolution limit of a camera sensor can be visualized by considering the number of pixels required to resolve a line pair. Courtesy of Edmund Optics. The Nyquist frequency — the highest frequency a sensor can resolve — is effectively 2 pixels, theoretically the minimal number required to resolve a line pair, or alternating pattern of one black and one white square. The limiting resolution of the sensor is calculated by the inverse of the size of 2 pixels. Thus, smaller pixels tend to have a much higher limiting resolution compared to larger pixels, although small pixel sizes have their disadvantages as well. Signal-to-noise ratio is worse with small pixel sensors compared to sensors with larger pixels, and noisy images can have devastating implications in optical testing or medical devices. Most microscopy applications have quite small fields of view, hence the overall light in the field becomes spread out over each individual pixel. With this drop in per-pixel illumination, contrast acutely decreases. Illumination is especially important in fluorescence, differential interference contrast (DIC), and especially dark-field microscopy, requiring high light sensitivity (increasing the amount of light per pixel) due to low light throughput in each of these cases. Miniature microscopes with small optics and small apertures already run the risk of vignetting large sensor formats. As such, the optics must be paired with an optimal imaging device — a sensor with pixels large enough for efficient illumination and small enough for desired resolution, but not so large in overall format that the sensor becomes under-filled. The future of microscopy — whether in life sciences research, testing, or deployable products — will depend on miniaturization, system flexibility, device portability, and increased resolution. The challenges ahead for these optical systems lie in optimizing and combining this balance between high resolution and small form factor. Nirantha Balagopal is an applications engineer at Edmund Optics Inc., where she is responsible for providing application-specific optical solutions. She has a master’s degree in optical sciences from the University of Arizona; email: nbalagopal@edmundoptics.com. 3. E. Gibson et al. (2015). Miniaturized fiber-coupled confocal fluorescence microscope with an electrowetting variable focus lens using no moving parts. Opt Lett, Vol. 40, Issue 11, pp. 2553-2556.